Saratoga's reputation as the "graveyard of favorites" continues. 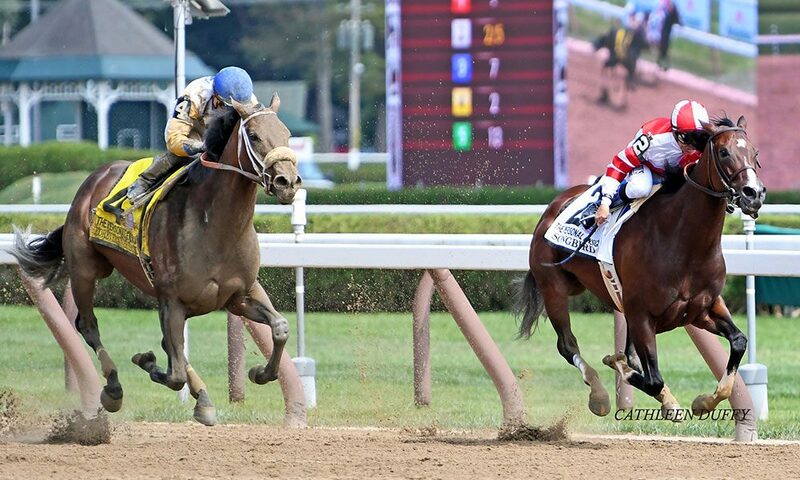 West Coast took the east coast by storm, winning the Grade 1, $1.25 million Travers Stakes Saturday at Saratoga Race Course. The Flatter Colt brought the trainer-jockey duo Bob Baffert and Mike Smith their second straight Travers win, having won with Arrogate in 2016. Before a crowd of 47,725, West Coast and Smith gained an early lead in the field of 12, comprised of Kentucky Derby winner Always Dreaming, Preakness winner Cloud Computing and Belmont winner Tapwrit. This year marked the third time in the 148-year Travers history, and the first since 1982, that three individual Triple Crown winners competed. Despite the star-studded cast, West Coast, on a three-race win streak, held on to his lead, winning by 3 ¼ lengths with a time of 2:01:19. The Dialed In colt Gunnevera came in at second, placing in his first graded stakes since spring, and the Tiznow colt Irap placed third. The Travers victory was just part of a great day for Baffert and Smith, who won the Grade 1, $600,000 Forego with Drefong earlier on the card. Baffert became the first trainer since 1989 and 1990 to win two consecutive Travers races, and collected his third win at the Stakes, having won in 2001 with Horse of the Year Point Given. Returning $14.20 for a $2 win wager, West Coast’s win was his fifth since his February debut. He has never placed worse than second in his seven career starts, and with a win at the Travers, improved his lifetime bankroll to $993,800 from his purchase price of $425,000 as a yearling. Baffert says the key to West Coast’s win was his composure in the paddock before the race. Baffert told the racing site Brisnet that no plans have been set for the colt’s next start. Coming off a win against three Triple Crown winners, though, perhaps he deserves a well-earned break. Other notable races on the card for Travers Day included the Grade 2, $400,000 Woodford Reserve Ballston Spa and the Grade 1, $700,000 Personal Ensign. In the Ballston Spa, Lady Eli, trained by Chad Brown of Mechanicville, nabbed a come-from-behind victory, Horse Racing Nation reported. The Ballston Spa was the five-year-old mare’s final start at Saratoga, and her win was made all the more amazing considering her life-threatening bout with laminitis, an inflammation of tissues in the hoof, just last year. Despite the success Smith had riding West Coast and Drefong, he was upset on Songbird during the Personal Ensign. The usurper was Forever Unbridled, trained by Dallas Stewart and ridden by Joel Rosario. Songbird, going in with a career 13 wins out of 14 starts, gained an early lead, ESPN reported, but lost it in the stretch to Forever Unbridled, who won by a neck. Mike Smith winning rider aboard West Coast (No. 3): “They said, ‘listen, you ride him however you want, and he’ll put a big effort,’ and that means I could do whatever I wanted. Just off of the way it looked, I said I was going to get aggressive leaving here, and see where it puts me. If it’s not in front, it puts me in the race, and I’m happy with that. I thought there wasn’t much pace, but man, I caught a good jump, put him on the lead, and he just cruised from there. He was a happy horse all the way around there. There was a time or two when they came to me, but he just put them away, and every time they would he’d take a big old breath of air, so I felt confident he’d continue to run well.